What follows is a preliminary discussion motivated by my early observation that scribes formed ligatures (combined letters) at the ends of lines differently. It had been generally accepted that one main scribe copied the St Chad Gospels. From these differently formed ligatures, I began exploring the possibility that four or more scribes copied this great gospel-book. I have since published an article arguing for multiple scribes, "The St Chad Gospels: Ligatures and the Division of Hands," Manuscripta, 59:2 (2015): 159-86. Assessing the number of scribes (hands) who copied the St Chad Gospels, as with any Insular gospel-book, is a challenge, one that regularly does not resolve itself easily. The ability of scribes to replicate different scripts and each other's tendencies within a script, much like draftsmen and calligraphers today, makes discerning between scribes difficult. Complicating the issue, transitions from one scribe to the next were carefully orchestrated. In the example of the Book of Kells, scribes replicate each other's preferred pigments and style of transcription during a transition period, phasing in their own preferences within a few folios. The uniformity of the script within the St Chad Gospels suggests one scribe, with perhaps, as proposed by Dean Savage, a second who copied the extra version of the Pater Noster at the end of Mark's gospel. However, one line in Matthew bears definitive witness to a second scribe's work on the text, if only for seven words, and raises the question of hands. Lemuel Hopkins-James appears to have been the first to notice this different hand in Matthew 27:62, page 138, and he combines this evidence with that of a slightly condensed script in Mark and Luke (leading to an increased number of words per line) as evidence of two different scribes: one for Matthew's gospel and one for Mark's and Luke's. He might be correct; there is a logic for different scribes copying the different gospels, working simultaneously to speed the slow, labor-intensive work of transcription. However, in some insular gospel-books, a tendency exists to emphasize Matthew, echoing St Augustine's sentiment that the evangelists Matthew and John spoke with the greatest divine authority. For Augustine, their authority was reflected in the ordering of the gospels, with Mark and Luke literally placed in between Matthew and John, as if two sons. Such an attitude could warrant a slightly larger script for Matthew. Unfortunately, John's gospel does not survive in the St Chad Gospels. Therefore, no comparison to Matthew is possible. I agree with Hopkins-James that at least three scribes copied the text; however, I want to propose that the scribes alternated work within each of the surviving gospels. For this proposal, I offers the gist of a longer article I am working on. It is based on a difference I noticed in the ligatures at the ends of lines. While Insular scribes generally attended to replicating the style of a script for transcribing a manuscript, especially in areas of transition, I want to propose, at least in the St Chad Gospels, that scribes did not attend as closely to ligatures and punctuation, offering evidence of the different hands. The line that Hopkins-James points out as copied by a different scribe is the second line of page 138 and reads: autem die quae est post parasceuen conuene. The letters are condensed and slightly squared in comparison to the other lines, noticed in their bowls, particularly in the R of parasceuen (the u has been altered). In addition, the ends of the Ss are turned inward and touch the spine. I have not located the bowls of Rs squared to this extent in other places in the manuscript. If Hopkins-James is correct and a second scribe tested his hand on this line, the scribe altered his script successfully to replicate more closely that of the scribe of Matthew when he later took over the transcription. However, multiple reasons exist to explain the possibility of a scribe writing one line of script, with testing one's hand only one such speculation. After all, a scribe could test his hand as easily on a scrap piece of vellum, which must have been available in a scriptorium during the making of a major gospel-book like the St Chad Gospels--calf hide being expensive and the trimmings likely saved for various uses, such as repairing small holes in vellum. Alternative reasons might include honoring, being honored by or celebrating a visiting scribe by having the scribe copy a line of text in a great gospelbook. Much is unknown about such practices in Insular monasteries. With the growing evidence of women working in scriptoriums, witnessed in the Chad Gospels by the female Anglo-Saxon names in dry-point (although these are likely from the 10th or 11th century), this line could offer witness to an early female (nun) scribe's writing, perhaps the scribe copied one line to test her hand or as an honor to her skill as traditional gender boundaries prohibited her from a larger role in the transcribing. Of course, these reasons are speculative, with these only some of the myriad possibilities, this one line making for intrigue in that it is clearly in another scribe's hand. While modern conventions, printing practices and word processing software has all but eliminated contemporary writers' concerns about line-space and the right margin, line endings for scribes transcribing text were a constant predicament to be managed, particularly in great gospel-books. The scribes of the St Chad Gospels relied predominantly on ligatures, and of extant gospel-books, St Chad's scribes appear to have refined and developed ligatures further than other manuscripts had at their time. Common and uncommon ligatures are found throughout. They include ma, at, ae, it, di, on, ui, us, and the one on which I will focus, nt. For the nt-ligature, a scribe extends the last stroke of the n, elongating it below the baseline, as if a descender, and curving it at the bottom and toward the right to form the lower portion of the t. The extended stroke is crossed to form the t's cross stroke, offering an elegant solution for managing the space at line's end when the common nt ending is involved. On the right, I have included the nt-ligatures as they occur chronologically within the pages of the St Chad Gospels. Some of the ligatures exhibit more exacting strokes than others, with serifs rendered on the t's cross stroke and bottom terminal. Others appear as if the scribe completed the n and then transcribed the t (as evidenced in the ligature on page 49, with the ever so slight gap, or page 110, where ink appears added to connect the bottom of the n to the top of the t). However, I want to focus on two noticeable differences that separate five of the ligatures from the others: three in which the t's cross stroke nears a horizontal position in relations to the line of text and two in which the n and t lack continuity, with the t rendered as if positioned below the n rather than as an extension of it. Both of these are indications that more than one scribe is at work, scribes who envision and form this ligature differently. The two ligatures in which the t and n lack continuity are on pages 170 and 174. On page 170, the t is made with a thin stroke, as if the scribe does not wish to intrude on the space between lines. This thin stroke differentiates the t from the n, which is substantially thicker, and breaks the sense of continuity between the two letters. The t is also transcribed perpendicular to the last stroke of the n, as if it is meant to be below the n rather than connected to and extend it as occurs in the majority of the nt-ligatures. The t of the ligature on page 174 similarly appears as if it is meant to be below the N rather than extend it. But the larger sense of this ligature's lack of continuity originates from the scribe's choice to use an uncial N rather than the miniscule n (Insular half-uncial includes both forms of the n/N). This choice differentiates the ligature from all of the others. By not using the miniscule n, the scribe eliminates the sense that the last stroke flows easily downward and into the t, the curve of the miniscule n's shoulder reversed and mirrored in the curve of the t's lower portion. The mirrored curves and flow are part of this ligature's elegance as a solution. The choice to use an uncial N might reflect the scribe's preferences, but it might also reflect a mistake, the scribe momentarily losing track of his place on the line during his transcription and falling into the habit of using the uncial N--the uncial N is more common in the St Chad Gospels and other Insular great gospel-books. The lack of continuity in the ligatures on pages 170 and 174 signals a change in scribes. Whether the same scribe transcribed both 170 and 174 can be debated, but the shift from the elegantly executed ligature on page 167 to the clumsily executed ones on pages 170 and 174 marks different scribes--a scribe is unlikely to shift so dramatically in his ability and approach to forming ligatures. From pages 167 through 174, I found some slight variations in a few of the letters but nothing consistent or definitive and outside normal variations within a page. While the difference in ligatures marks a change in scribes, the scribes precisely and beautifully replicate the script that begins Matthew's gospel and carry it throughout the St Chad Gospels, a script that perhaps reflects that of a treasured exemplar. The second noticeable difference in nt-ligatures occurs on pages 155, 101, and 49. The ligature on page 155 is the most extreme in this group, with the cross stroke of the t nearly horizontal to the lines of text. On pages 101 and 49, the line is slanted but does not attain the approximate 40 ° of slant rendered in the majority of the nt-ligatures, thus signaling another scribe. My sense from the ligatures, therefore, is that at least three scribes worked on the St Chad Gospels, and possibly more, alternating between themselves on the transcription. Life would have been unpredictable in the early 8th century, and the need to be flexible, particularly if the St Chad Gospels is the product of a smaller monastery and scriptorium, might have encouraged such alternating between scribes, promoting an attentiveness to skill in replicating another's hand. Or, perhaps as likely, the community was dedicated to an exemplar's style of script, or the ability to replicate a style of script was a hallmark of the scriptorium, that this skill received an emphasis and focus commensurate to the community's values, aesthetics, and spiritual practices. While the Ss differ in their lower portions, the Ns are remarkably similar, particularly their stems, and the Rs echo each other in shape and stroke, down to the backstroke that terminates the leg. But strikingly, the O is similarly off kilter in both, with extra thickness in the upper right quarter, suggesting a consistency of angle and technique in transcribing the letter. As we move through the lines of Mark's Pater Noster, we find that the Ss return to their typical proportions, suggesting that the scribe simply stretched the S on the opening line to help fill the available space. 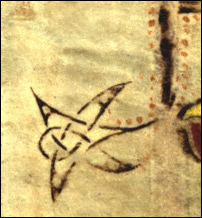 Perhaps the best evidence that an additional scribe copied this text, or at least a different scribe from the one who began Matthew's gospel, is the decorative star that flows from the stem of the P of Pater. 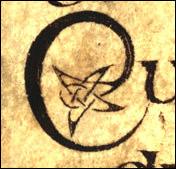 This star nearly replicates the star that begins the second chapter of Matthew's gospel, down to the curves of its arms and points, except for one aspect: the star, formed from an inventive interlace pattern, has its weave reversed, that is, the line on top goes under and vice versa. This is typical of the variations and asymmetry of imagery and decoration in Insular gospelbooks, seen elsewhere in the St Chad Gospels, like in the foot positions of Mark and Luke in their respective portrait pages, in essence the positions of the left and right feet reversed. The likelihood that the Pater Noster is copied by a different scribe than the one who began Matthew is evidenced by the line which connects the star to the P. It begins slightly to the right of the P's stem, with a new stroke. This suggests that the star was added later, after the transcription; otherwise, the scribe would have extended the P's stem, continuing the stroke, and transitioned directly into the star, like the star that begins Chapter 2 of Matthew's gospel (on page 7) This star emerges seamlessly from the terminal of the C, the terminal splitting into two strands, one forming the star and the other returning to the C upon the star's completion. If the scribe of Matthew's second chapter was called upon to draw this star after the transcription was completed, that would account for the similarities between the two stars, the scribe's play with variation, and the star's formation from a new stroke. The star is a curious addition for decorating the Pater Noster. For the star to appear at the beginning of Matthew's second chapter is fitting: the chapter tells the story of Christ's birth, with the wise men following the star in the East to Bethlehem. But why does the star accompany the added Pater Noster? Perhaps for the community the star had become a symbol of the new hope of Christ or the journey to Christ, a metaphoric expression through a detail from the beginning of the story of salvation in Matthew. The community would have likely found this new beginning for humankind or journey toward Christ exemplified in the prayer of the Pater Noster. But there is also an echo, perhaps too literal to be intended, of Mark 16:19, its last few words just above at the top of page 217. This verse speaks of Christ ascending into heaven and sitting at the right hand of God. Oddly, this star, a likely representation or symbol for Christ, is placed at the right hand of Pater, God addressed as father. Such imagery might refer to Christ's believed place in heaven, next to the Father, and suggests the power of this prayer and Christ's nearness to God for intersession, particularly with the prayer's request that trespasses be forgiven. While the script of the St Chad Gospels' text remains uniform, variations amongst the nt-ligatures offer evidence of multiple scribes working on this great gospel-book. This knowledge can be further refined by examining other features of the text, like additional ligatures and punctuation, honing our sense of where transitions took place. Understanding the number of scribes who copied the St Chad Gospels not only opens insights into scribal practices, but it also offers a view of the larger practices involved in the making of the St Chad Gospels, furthering our understanding of its story, community, and times.